Also required: a 20 cm removable cake tin (spring form), 2 bowls and an electric mixer. Optional (Cherries contain low fructose): 1 cup morello cherries (frozen or fresh), stones removed. 1. Preheat oven to 180c degrees. Make a single layer a piece of baking paper for the base of the springform and a double layer wide to cover the sides. 2. Combine coconut cream, syrup and cocoa well in a bowl using a spoon to get a smooth and shiny mixture. Put aside about 1/4 cup of this chocolate mixture and save it in a fridge for later use when the cake will be ready. 3. Using an electric mixer beat egg yolks until creamy. Add all the remaining chocolate mixture and continue mixing on the medium speed until completely incorporated. 4. Place egg whites in a second bowl and let the mixer run until soft peaks form. 5. Add almond meal to the bowl with the chocolate mixture and combine to get a consistent mixture by using a large silicone spatula. 6. Dividing into three portions, gradually and gently fold the egg whites into the prepared chocolate-almond mixture through in a figure of eight movement with a large spatula. 7. Pour the cake dough into the middle of prepared tin, and if the cherries are used, mix them in during this step. Bake for 25 mins at 180 degrees in a fan forced oven. Then turn off the fan and bake for another 15 minutes at 160c. 8. Let it cool approximately to the body temperature before removing from the form. 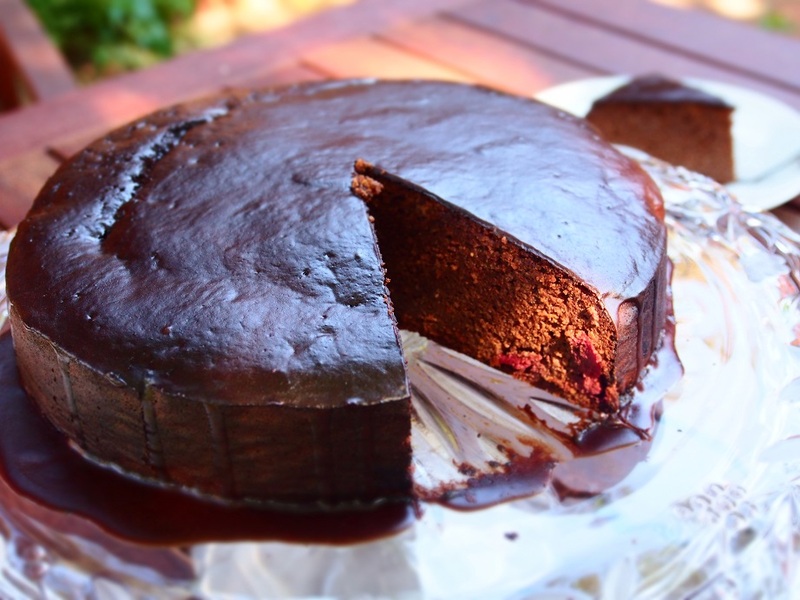 Once cake is on the platter, spread the saved 1/4 cup of chocolate on top of the cake. It should melt and run through the sides of the cake. Mmmmm what a delicious looking cake!